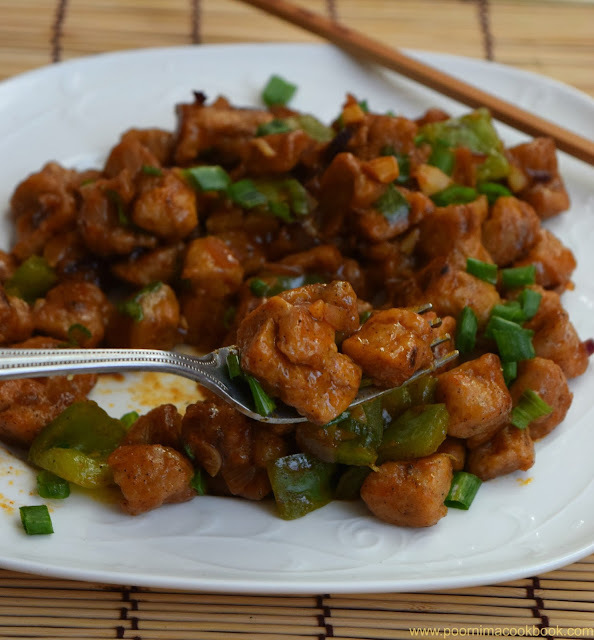 Try this Indo - Chinese Manchurian recipe using Soya chunks as the main ingredient. 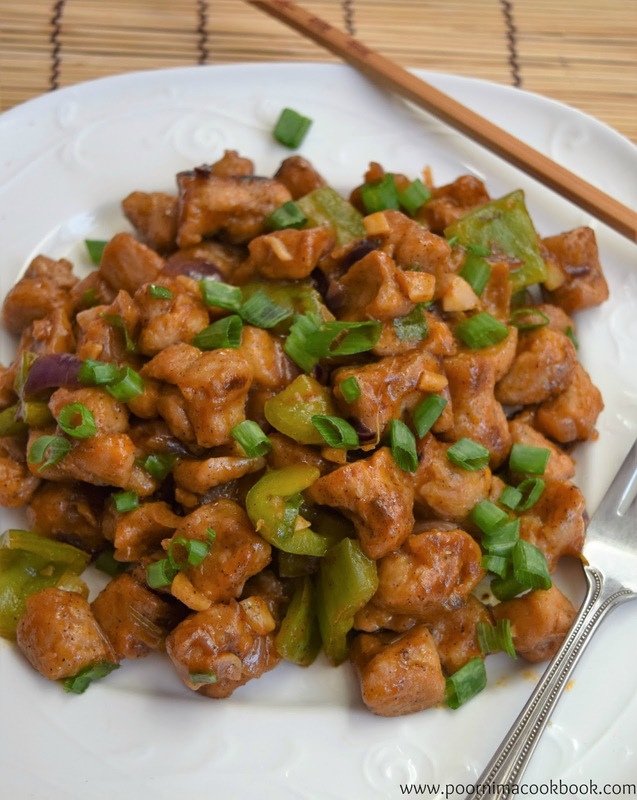 Soya chunks is high in protein and low in cholesterol; an excellent substitute for meat based proteins. Actually I have tried many Indian style recipes using Soya, especially cutlets, kurma, biriyani etc... but this is the first time I tried using Chinese flavors. It came out very tasty. Here I have given both the version of Manchurian dry and gravy. Give it a try and feel free to write your feedback. Soak soya chunks in water for about 20 minutes and cook the it in water till it becomes soft. Once it cooled down; wash it for 2 to 3 times and squeeze the water completely. Take a bowl and add corn flour, all purpose flour, salt and white or black pepper with little water. Add the soya chunks into batter and mix well. Batter should be thick enough to coat the soya chunks; allow it to marinate for 10 - 15 minutes. Heat oil in a kadai and deep fry them in medium flame till it reaches golden brown colour. Keep aside. Heat oil in a pan; add soya chunks and stir fry that till the colour changes. Keep aside. Now in a separate pan, heat 1 tbsp oil; add finely chopped ginger and garlic. Fry that; add chopped onion, white part of the spring onion and green chillies and saute till onion become translucent. Followed by that add cubed capsicum; just give it a stir. Allow to cook for 2 minutes and then add all the fried soya chunks. Give it a toss, till the sauce coats the fried soya chunks well. 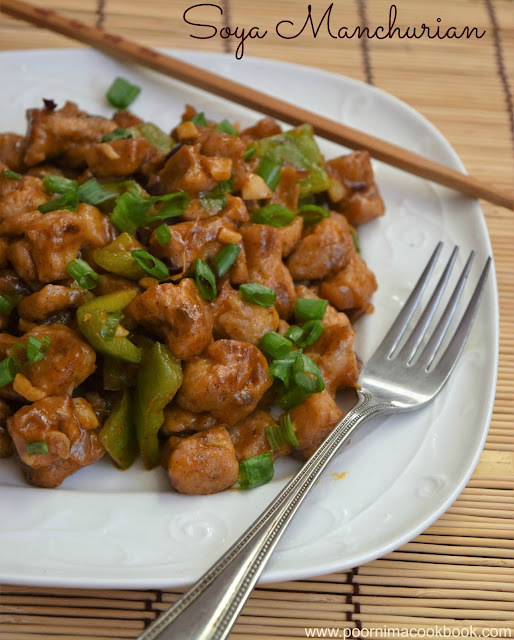 Follow the same method and before adding deep fried soya chunks mix 1 tbsp of cornflour in 1½ cup of water without lumps and add to the sauces. Allow to boil and once it starts to thicken add the soya chunks. Give a toss and garnish with spring onions. Serve hot with noodles or fried rice. If you are using red chilli powder; increase the tomato sauce amount to adjust the taste. You can very well increase or decrease the sauces, pepper powder and salt amount to suit your taste. 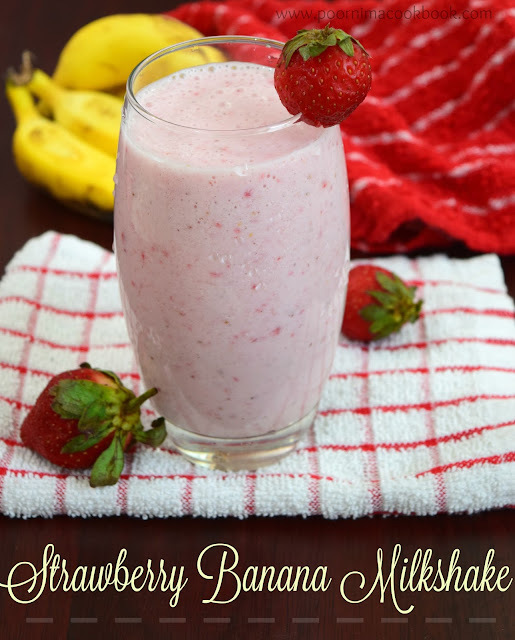 Though it has many nutritional benefits, moderation is advised due to its high protein content. 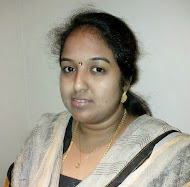 Long time Poorni. How have you been? Chinese or rather Indo- Chinese is my favourite. Yummy looking manchurian poorni. I too made some manchurian previous week and posted it today.